Remember to measure your pet for the paw-fect fit. Keep your dog stylish and warm with the PetRageous Calgary Dog Coat. This triple-layer heavyweight coat is water and windproof to keep your furry friend safe from the elements. This comfortable jacket offers full chest coverage and an attractive two-tone design with reflective tape to ensure visibility on night time adventures or darker days. 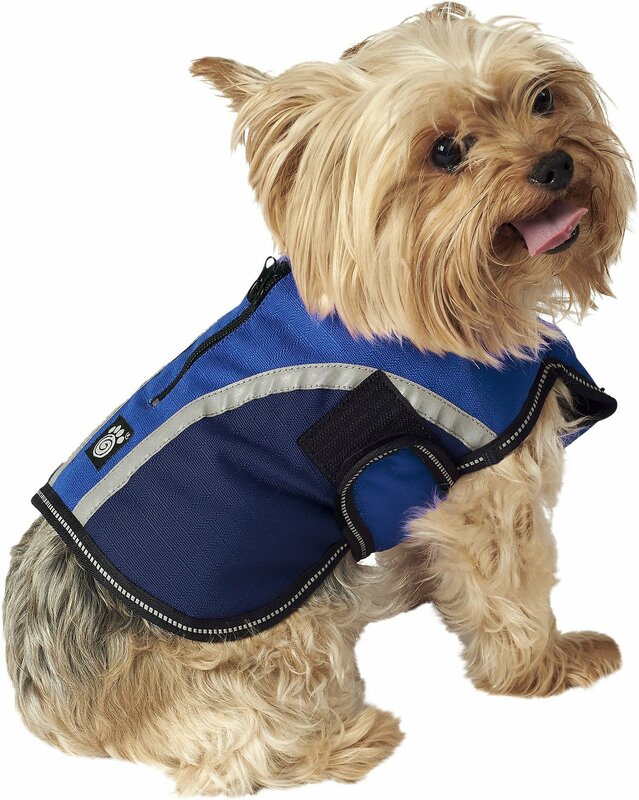 The adjustable fuzzy fastener belt guarantees a snug but sufficient fit, the two-way zipper on the back allows for easy access to a harness and the opening in the collar offers a convenient path to add or remove a leash. 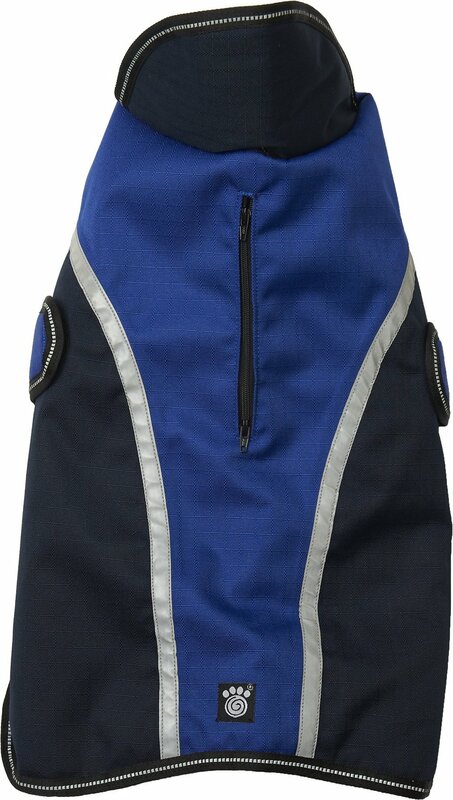 Attractive two-tone coat is fetching and versatile, keeping your dog safe from the elements. Triple-layer heavyweight coat is water and windproof, perfect for wild adventures or harsh weather. Reflective tape keeps your pup visible during the night or dark days. Adjustable Velco belt allows this coat a snug but comfortable fit. 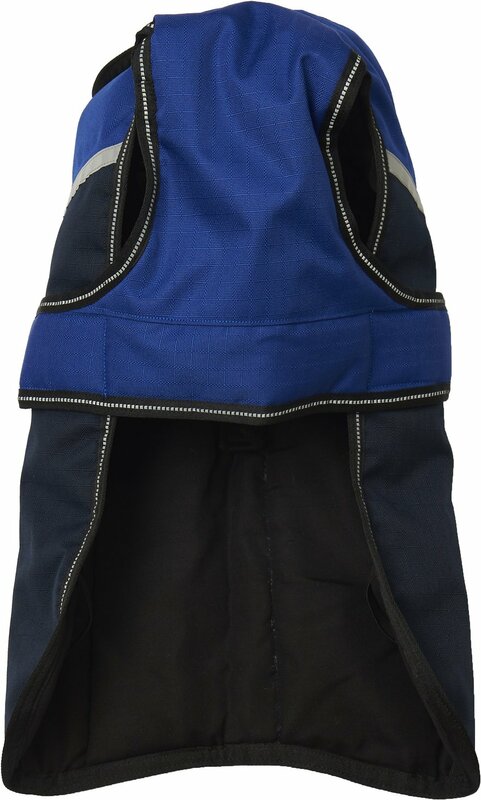 Two-way zipper on the back ensures easy access to a harness and the opening in the collar allows for convenient leash attachment. Very impressed with this doggie coat. It is very well made, water repellant, warm, and colorful! I have 3 beagles (we bought 3 of these!) and they absolutely MUST use a harness so I really liked the adjustable harness zipper on the back of the coat. One of the frustrating issues I had with other dog coats was that the velcro was on the lower part of the coat and would get wet with snow and come apart a lot on walks! This velcro is higher up and away from the ground so there aren't any issues with snow. All in all, a really great coat! So far, it has been a good cover for our poma-poo who loves to walk in nearly every type of weather. This was our 2nd try. Chewy return policy is great, no hassle and full refund quickly (minus the S/H). Donated the too large item to dog rescue. My southern rescue girl is not accustomed to northern winters and so she is now wearing a jacket only on the coldest days for the first time. Will take her some getting used to, but jacket is warm and has a great fit. She is a fit 55lb boxer pit mix and size large is perfect. Easy on and off with the front velcro that goes under her belly. There are elastic straps for the back which I wish were velcro because she hates the elastic but I just make sure the front velcro is good and snug and don't bother with the elastic straps. Overall, I thought it was a very good value for the quality. I was really excited to see what looked like a really warm, well made jacket. Unfortunately after a single use on my very mellow dog, the fabric near the harness zipper starting coming out at the seam. I think I’ll need to return it and find something else. It’s really too bad! I think this coat would have been perfect otherwise. The fit is on the larger side. 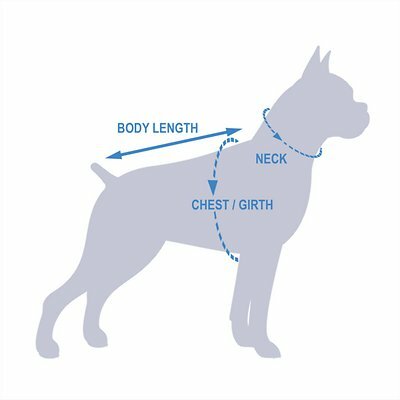 My dog is usually a medium and aligned with the medium size chart. The length is a tad long but I think that’s a good thing for the more intense winter days here in New England. Just the coat we hoped for! This winter coat is the best!I have tried multiple jackets with the velcro on the chest & neck. Within a month the velcro was done. Not with this coat. It wraps up the sides no dog fur in the velcro. The chest is also covered keeping Bug warmer on those extra cold days & nights. 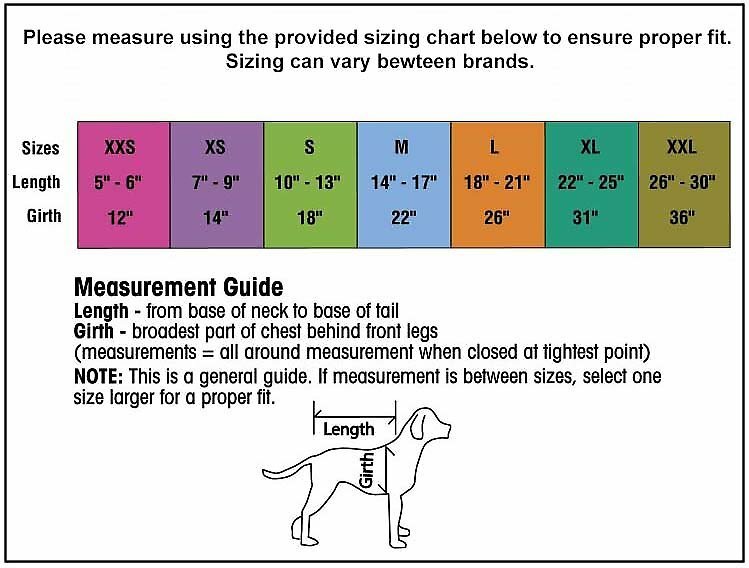 Use your dogs true measurements. Don't add any additional inches. Bugs is a 21# Boxer/Boston mix with a deeper chest. The size medium fits prefectly. There is enough room to fit over his walking harness. The only drawback is it goes over his head. Bug does not care for that but in the end he can go for longer walks in the winter. So this coat is a score! After buying the wrong size (XL), which Chewy told us to keep and donate to a shelter, we got the medium size for our hard to fit Corgi. It's perfect. Well made and keeps her dry and warm. She doesn't like jackets much but has no problem wearing this one. It's easy to put on and take off. We don't use the elastic for the back legs but the coat doesn't shift around on her body. It stays snug against her. Collar/harness hole is sufficient for her leash and Velcro sides haven't come undone during walks. The medium almost covers her back end. She likes this one and I highly recommend it. I purchased this for our beloved beagle "Todd". Unfortunately, he passed away after using it a few times. It went on easily and did keep him warm. My sister will inherit this for her poodle "Chester". I would highly recommend this coat. The quality is excellent and looks great on.